It's late March, and Tax Season is winding down. This year, I am highlighting one of my favorite pieces of financial literature: You Need A Budget. Have you read this book? You Need A Budget originated as a personal-finance software program developed by Jesse Mecham. His program, which is currently available commercially for smartphones, is mainly budgeting software that is designed to increase personal affluence through the tried-and-true method of properly allocating money for expenses, paying off debt, and making a comfortable life more feasible. His book does much of the same work, but is contained in an easily-digestible reading format. No software is included, or necessary, to get the message here! The last sentence cannot be stressed enough. Mecham mentions his software once or twice, and that's it. He does not spend half his book recommending the reader to use his software, which frankly, is already similar to many other alternatives. 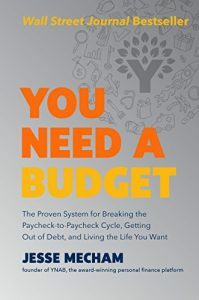 Instead, Mecham intelligently insists that all of his advice can be obtained through the book, and budgeting is as simple as a pencil and paper (and calculator for those who need it). You don't need an expensive, complex software program to do your budgeting, and Mecham recognizes that; what he offers is for those who really want it, as a way of making their budgeting more streamlined and less tedious. -Money is a tool that helps us obtain the things we want. -Budgeting is how we express our interests and morals, by allocating the money we earn to the things we value most. -Budgeting is priority-driven. It helps us do the things we want, one step at a time. Rule One: Give every dollar a job. Rule Two: Embrace your true expenses. Rule Three: Roll with the punches. Rule Four: Age your money. Mecham's budgeting philosophy comes out quite nicely. Account for all of your money; what you need to keep in your account without accruing fees, what you need to save, what you spend on groceries, bills, etc. All of it, 100%. Even savings. Budget for what you actually spend; don't set unrealistic goals, like $75 grocery bills for the household per month when you regularly go over $150. Be prepared for unexpected events and surprises, regular and sudden; it's easy to forget birthdays and weddings and car repairs are an inevitability. Aging your money is arguably his most important lesson, as Mecham's goal is to get readers ahead on their bills; pay for next month's utilities today and next year's insurance this year. The more ahead of your expenses, the better. You Need A Budget is useful in a variety of ways. Besides budgeting, the book also includes chapters on budgeting in a relationship and budgeting for children. Budgeting is simply one of those habits that is good to get in to at any age, and the earlier the better. Want to learn more about budgeting or personal finances? Feel free to check out some of these other items or take a look at last year's blog postopens a new window. As always, the St. Tammany Parish Library is always looking to connect patrons to the sources they need.